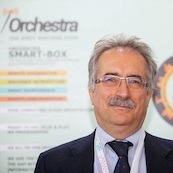 President of ORCHESTRA, has 25+ years of experience in international high tech start-up companies. Guido, a degree in Nuclear Physics from the Padua University, started his career as researcher at TUM München. He then covered a number of management positions within technical, sales and marketing departments in several organizations, which later led to his entrepreneurial career with national and international start-up companies. In 2016 he founds ORCHESTRA Srl, specialized in Industry4.0 projects.